Band 2 lunch lhr to lys. Mrs Thepi was not very impressed with her avocado and quinoa. No bread offered. I wonder if it would be possible for one of you lovely people to post images / advise menu for a Band 4 flight out of LGW for me now we are November. Details below. After flying monthly with BA most the year luck would have it that our last flight was a LH return 12.09 so this will be our 1st chance to actually sample the new food offerings & having kept a close eye on events I'm looking forward to doing so. Try to avoid afternoon flights ( returns are often evenings) so just looking to get an idea what this months offerings out of LGW are. Photos would be a bonus but just a menu/ text description would suffice just as well and thank you in advance. the menus are rotating every two weeks now so may well change by the time you fly. There are quite a few band 4 Lgw photos already on the thread - see the wiki for links - which will give you a very good idea of the type of thing that will be offered. What was your wife’s issue with the dish? Was there no bread at all served, or just that the crew missed your wife out? It was her first time in CE and I she was expecting something a bit more substantial. No bread was offered to any of the cabin I think. She was a fan of the dessert. Prospero and AnaTravel like this. I said that I would withhold comments on this until I had had a chance to experience pretty much the full range of the full regular offering (I stayed away from SPML on purpose until I tried everything). This is now done and I thought I would give my comments. 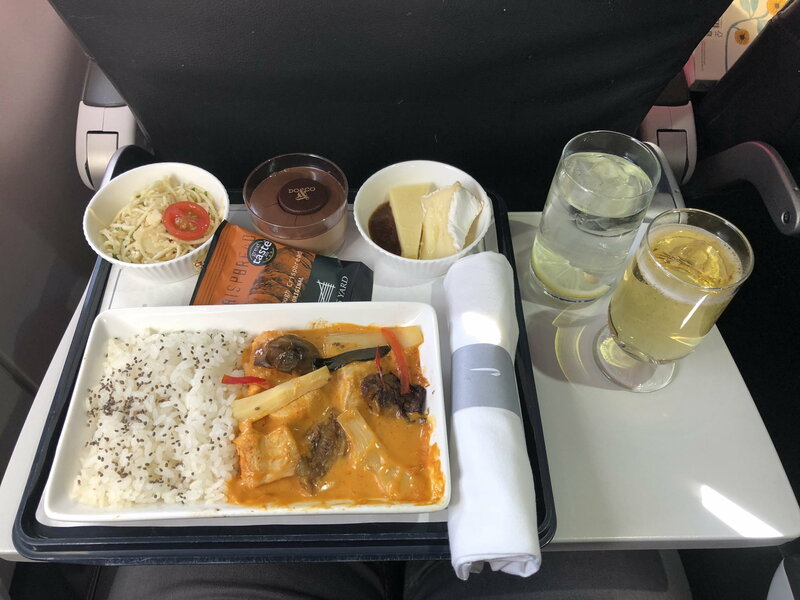 As a reminder, I was not a fan of the previous CE catering offer though I liked some of it - especially I thought that "long" meals were good and a clear improvement, that domestic CE catering was an improvement, and that the offering was still ok for very short flights. I thought the worst deal was for "medium" flights which I found thoroughly inadequate, and I also very much disliked a) the afternoon tea, b) the panini. 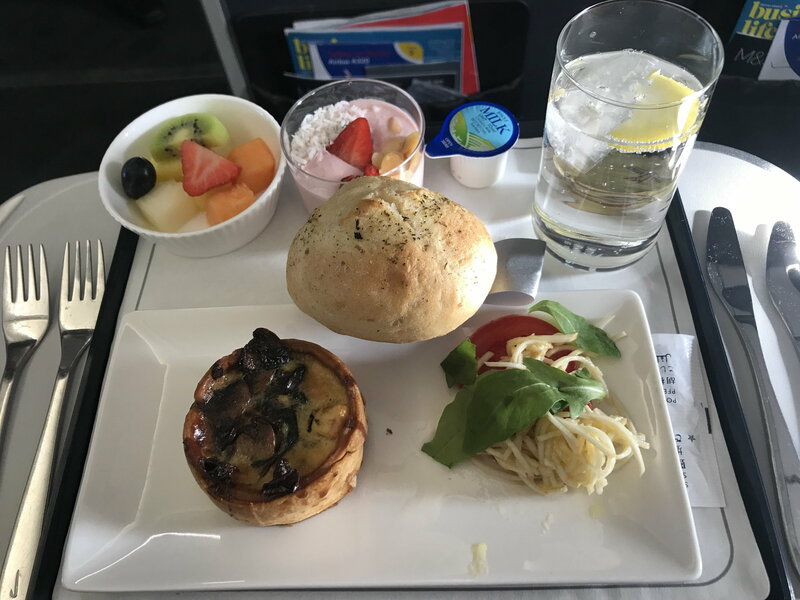 With the introduction of the new catering, the suggestion by BA was an improvement in both quantity and quality, return of hot meals on routes that had lost it, and return of the scones with afternoon tea. BA officially moved from 3 bands (2 of which actually had the same food offering) + express into 4 bands for a more granular offering. My experience is that this is actually nonsense. BA had 2 food bands + express before, and still has 2 food bands + express now. The bands are exactly the same as before. The difference is as big as before between them. Also as before, the difference between express and bands 1/2 (ex short/medium) only really applies to breakfast, after which the difference is no choice (express) vs choice (bands 1/2). I'm not sure if others have had choice on express flights, but I certainly have not. If anyone has had difference between bands 1 vs 2, or between bands 3 vs 4, I have not either. I actually agree that the quality of food on band Exp/1/2 (ex-Exp/Short/Medium) is higher than before. The salads are certainly more pleasant than before and slightly less tiny though still small. The desserts are a bit nicer too and the starters are a welcome addition though still not making the meal sufficient for band 2. I'm sure people who like afternoon tea find the current one nicer than before, but as mentioned previously, I'm not an afternoon tea person so I feel just as punished on tea flights now as I did before. The sandwiches are certainly less bad but they are still sandwiches and I personally couldn't care less about scones though I understand from people who like them they are good. On brunch flights, the quiche is a bit nicer than the panino but I still don't like those meals anyway. By contrast, however, I find that the quality on bands 3/4 has declined. Some mains are good (e.g the recent pork) but most are actually poorer than before (ring back the chicken breast with lobster pappardelle!). The starters are in major decline, they feel like US airlines Y salad starters. The desserts have taken a turn for the worse too in my view. The LHR ones are extremely sweet and rich. I very much welcome the reintroduction of a cold/continental option on breakfast flights. I also celebrate the death of the panino and a choice of two salads is better than a choice between salad and panino for me. My main observation is that with the new catering, with the exception of the beef salads, I have found the vegetarian option systematically better than the meat one. 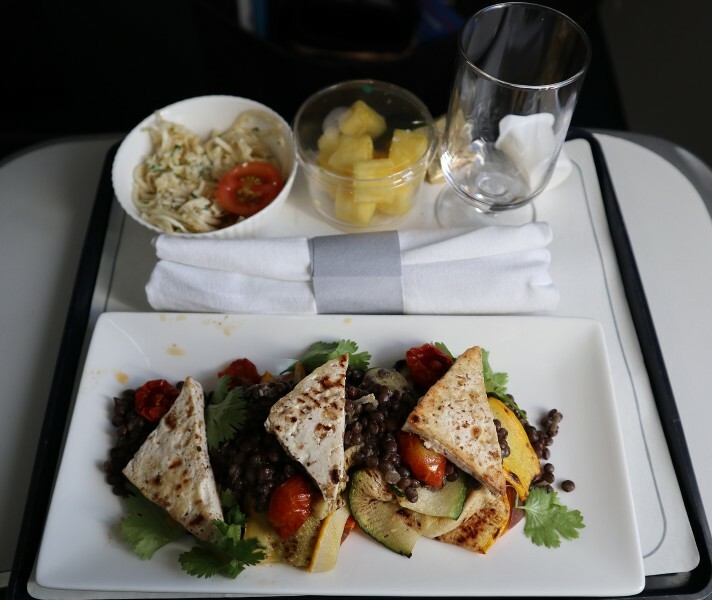 The current lentils and vegetables salad with feta to LHR is for instance a lot nicer than the chicken salad alternative which is almost as bad as the pre-change ones. On bands 3/4 too, the vegetarian pasta is almost always nicer than the meat option except the roast pork which was good. I know some others here liked the bangers and mash option, but I certainly did not and when I had it my sausage felt undercooked and sickly and everything was drowning in poor gravy. One thing often not clear is that on shorter flights, the vegetarian salad gets a different (and in my view nicer) starter. On longer flights, the choice is now meat or vegetarian. Before it was meat or fish which I preferred a lot. Basically, hot fish dishes have now disappeared from CE catering. Wine is better than before. I'm also happy to have seen a return of Pommery on several recent flights which I personally like better than Castelnau. Quantity wise, this is less than before for bands 3/4. A little bit more for bands 1/2. In my view, the biggest winners are shortest flights (express and band1) which was already acceptable before and is now even pretty good compared to competition. Longer flights (band 3/4) have been the big losers but they had won most last time round (especially the new band 3/shortest of longs). While band 2 has improved compared to before, in my view, the offering is still woefully inadequate for band 2 (e.g. medium). It was already worst off pre-changes. In my view, this has not changed and they are still proportionally worst off of all bands. It also happens to be the band I fly most so on the whole, I am still unhappy. CONCLUSION: All in all, the BA promise has not really been fulfilled. The quality has improved on shorter flights, but no destination that had lost hot meals has seen them reintroduced (bar MAD but that is just due to change of banding). In my view, the shortest flights are now proportionally best, longest have been downgraded from good to ok, and medium flights (now band 2) are still offering the worst catering/length value. 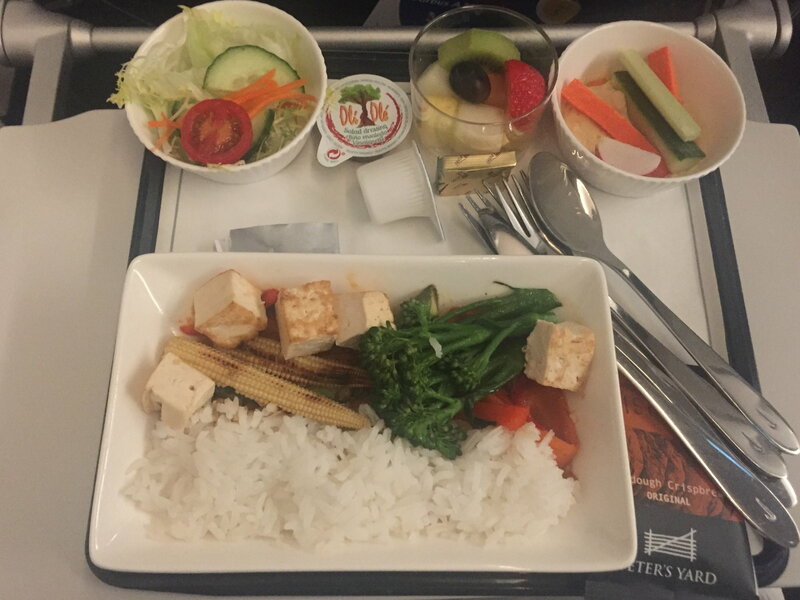 This has really been yet another zero sum game (or slightly positive) rather than a real improvement, and despite some progress, I am disappointed to see that BA has completely ignored the numerous complaints about medium catering and the disappearance of hot meals. On the whole, this is probably a small progress but also a wasted opportunity (unlike long haul catering which has been overwhelmingly positive in my view). lhrpete, choosethedrew, Boyfrombiot and 5 others like this. That was my meal on Wednesday 31st ex Lisbon to Heathrow. The curry was good and enjoyed it. Wasn't sure about the starter though. Chocolate dessert excellent. MarkP24 and ATCOlad like this. Absolutely delicious lunch LHR-PRG super tasty mushroom quiche. Dessert looked like Angel Delight but was lovely yoghurt. Prospero, Sealink and tedcruz like this. That drink change is positive. KARFA and TWCLAM like this. There was some dressing for the salad. The main course looks rather bland but it had a slightly spicy dressing (tomato with chili?). Surprisingly tasty but not great. The cheese course was replaced by vegetables with hummus. The dessert was a pot of fresh fruit and berries. All in all sufficient and rather tasty but not imaginative. The normal menu looked like the first rotation so the purser I quoted in an earlier post was probably wrong stating that there would be four rotations.